We have here the very first recorded Christian sermon, and of course it is all about Easter. When Irenaeus thinks back to the preaching and teaching of Polycarp, forefront in his mind are those discussions which Polycarp had with those who could give witness concerning the resurrection of the Lord. Have you ever wondered what it would be like to visit one of the earliest Christian churches? Here we have a glimpse. The church at the earliest times wasn’t shallow enthusiasm but neither was it all high brow theology, rather it was apologetic and christocentric, that is it sought to prove and defend what it believed and taught namely that Jesus was risen from the dead. This was its goal and its focus the death and resurrection of its Lord. It relished in this argument because it knew it couldn’t lose. The proofs of Jesus’ resurrection were just too convincing. One Lutheran pastor, Daniel M Deutschlander, wrote a series of Lenten sermons entitled the hidden glory of the Cross. In his Good Friday sermon he tells how one of the hidden glories of the cross is that it was all done as it was foretold. This in fact is a favorite theme of the Gospel of Matthew, “as it was foretold.” God the Father spent four thousand years making a rather large to do list for the coming Messiah, but Jesus wasn’t daunted. He didn’t find excuses to do it later. He checked them off his list one after another. Even when it came to one of the last things on the list, die in agony carrying the price of our sins, Jesus didn’t decide to put it off till tomorrow but went forward to do the task that was set before him. 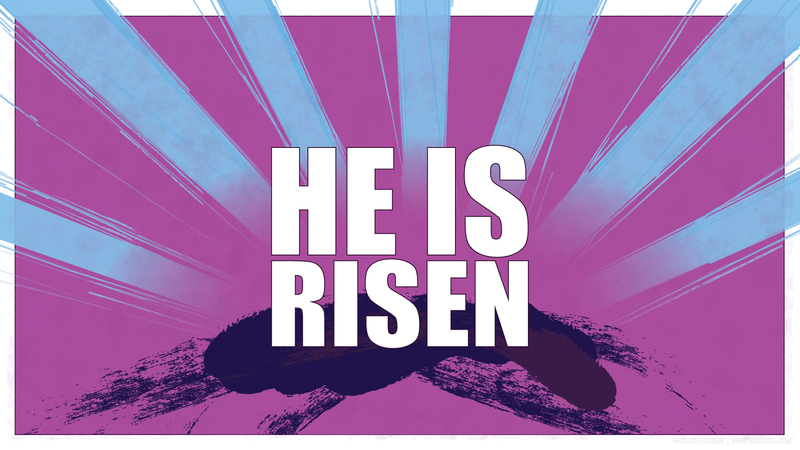 Many people find it ridiculous to think that Jesus rose from the dead. Even many who claim to be Christians, but which is harder? To knowingly walk to your own death on the cross bearing the sins of the world, or that God would raise his just and righteous Son from the dead. Christ did everything as He promised, as it was foretold, if He did everything else as He promised we can have confidence that He accomplished this as well. As it was foretold, Jesus has risen from the dead. Peter and the other apostles were there, they saw and they bore witness that Jesus both died and rose again from the dead. There have been many other supposed prophets in the history of the world, who claim to have witnessed God in one form or another and to speak for him. What makes the apostles different is that they had nothing to gain through lying. Many of the supposed prophets since their time have gained wealth and power through their claims. What did Peter and the other apostles gain? They were hated. They were beaten. They were persecuted. When they might have settled down in one spot gaining a following and storing up earthly wealth, they left and went wandering to new parts of the world where they were once again beaten and persecuted. Their actions show clearly that they truly believed that which they taught and witnessed, that Jesus had risen from the dead and was coming again to take them to be with him. They did not care about this earth they cared about the risen Savior. Thirdly Peter draws our attention to the witness which the Holy Spirit gave concerning Christ and the apostles. This was a powerful witness to the men to whom Peter is talking, for this is on Pentecost Sunday and these men have just observed the coming of this Holy Spirit for themselves. They could not deny that something powerful was at work. There were the flames of fire on the heads of the Apostles. There were the words of the Apostles’ speaking fluently languages they had never heard. Clearly the Holy Spirit was at work here. Some of them lamely attempted to pass it off as drunkenness, but who ever heard of drink causing people to speak clearly in different tongues. Alcohol causes people to speak less clearly not more so.